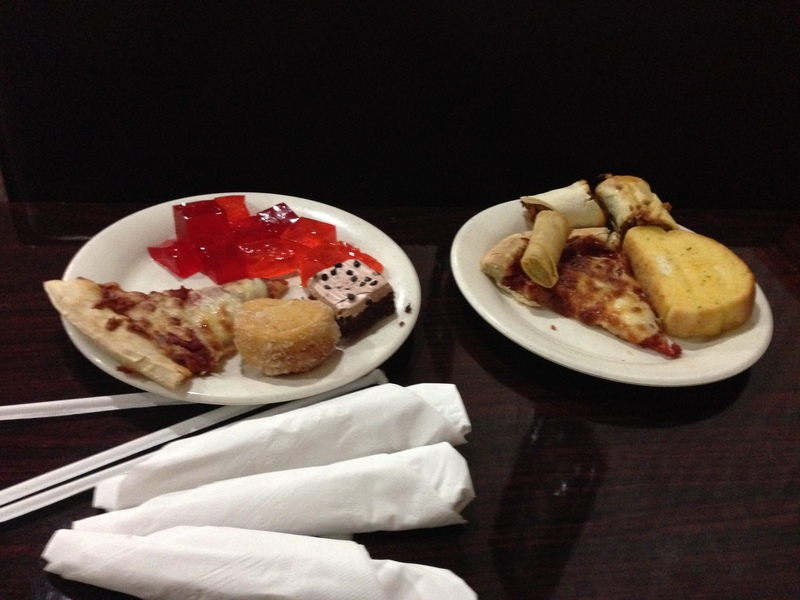 The kids and I have a tradition of going to a Chinese Buffet on spring break. I think it started when Isaiah tried egg rolls at school and liked them. I was overjoyed, because Chris got food poisoning the first time he ate Chinese and still holds it against the whole food genre. 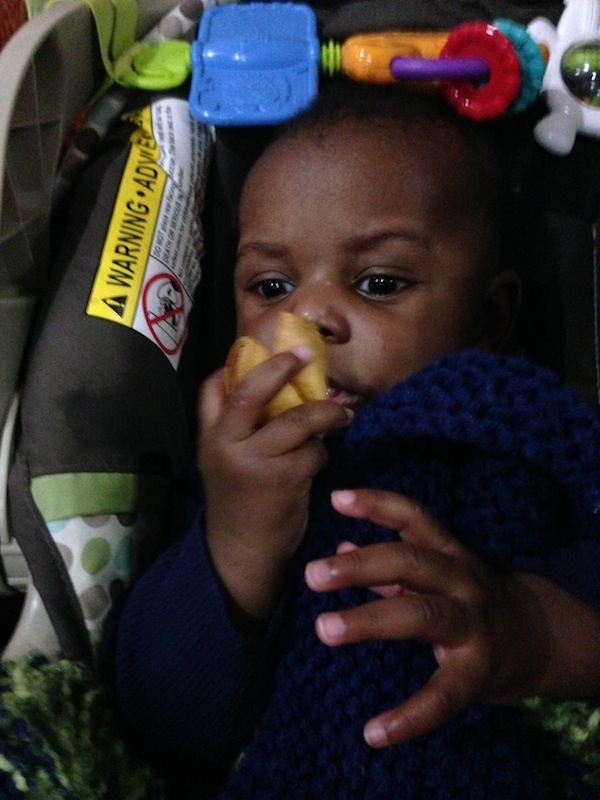 Turns out, the school must have given the kids freezer-section egg rolls, because Isaiah doesn’t like REAL egg rolls. But we’ve all kept going out for Chinese together anyway. The kids eat anything sweet they can find and I get my fill of delicious chicken and broccoli and crab rangoons. 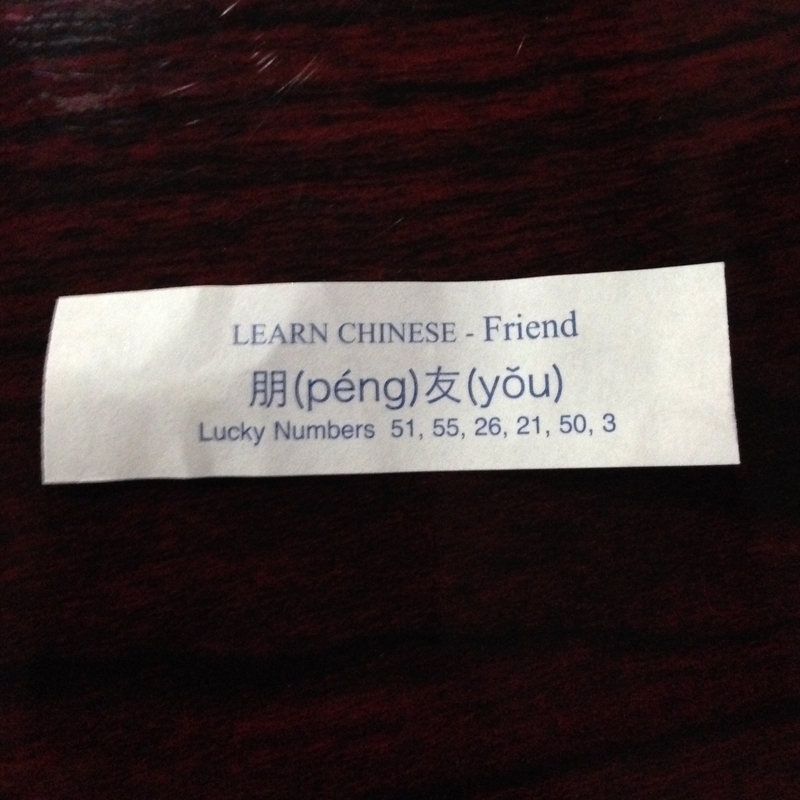 The waitress was sweet and gave me a fortune cookie for Enoch. I let him hold it. He promptly tried to eat it, which was very smart of him. But not a good idea. After the “Chinese” food, we went to the library next door. It was Enoch’s first visit, so we took a posed picture in front of books, because we’re all Pinterest like that. 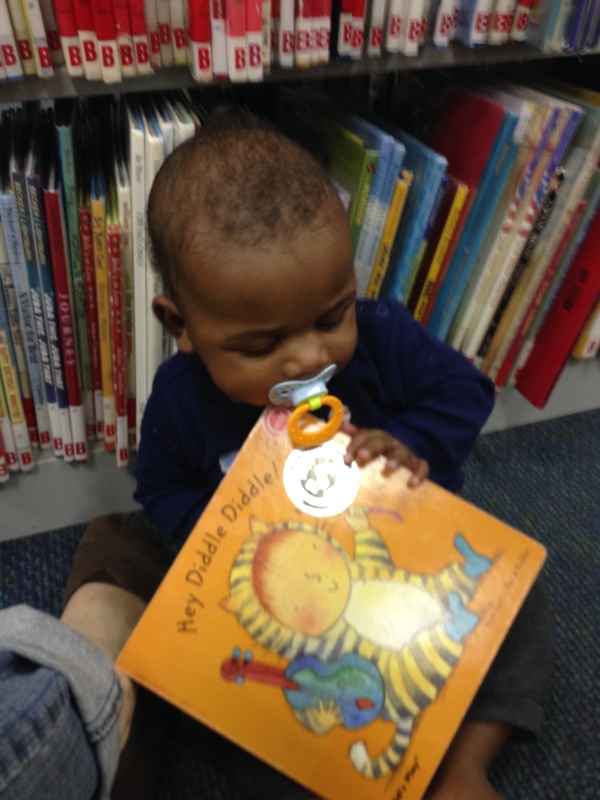 He immediately spit out his pacifier so he could taste the book. Don’t worry. 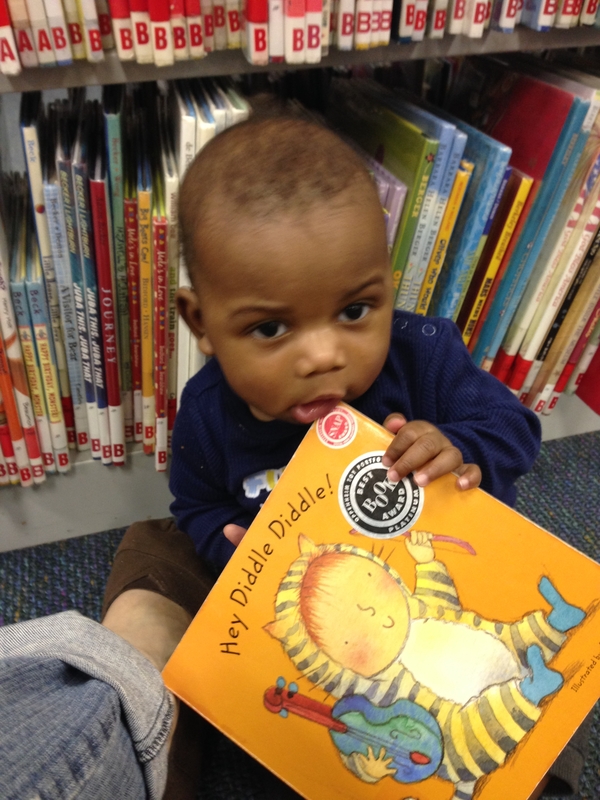 No books or baby immune systems were harmed. That was our day. I’m going to go sleep off my MSG hangover now. We took Isaiah and Leah to the library for the kids’ Christmas party, featuring a visit from Santa Clause. Most of the kids screamed, or at least got very shy, when it was their turn to sit on Santa’s lap. But not my son. He came running up to Santa waving his Christmas Bingo sheet (from the game they had played before Santa’s arrival) and began telling Santa all about it, complete with how to play. 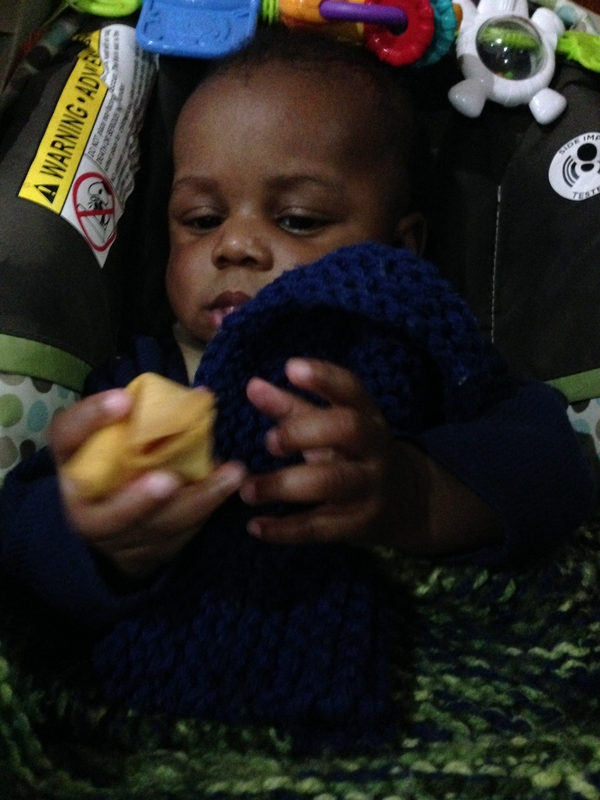 Isaiah’s definitely a people person! Leah did OK too. She was annoyed when I set her down in Santa’s lap, but after a bit of protest she ignored him and went back to her lolly-pop. Santa was probably annoyed that I sat a sticky one year old in his lap! He probably labeled me as one of THOSE parents. The kids each got a stuffed polar bear wearing a Christmas hat and scarf from Santa. Now, if you’ve been following our family saga, you know that Isaiah’s favorite buddy is a beanie-baby sized monkey named Mee-Mee. Chris’ mom stumbled across a bigger version of the monkey, made by the same company. So when she sent it to Isaiah, we told him it was Mee-Mee’s dad. When we asked Isaiah what Mee-Mee wanted for Christmas, he said, “Mee-Mee want his mom!” We tried to figure out how we could pull that off. So back to the polar bear. I was talking with him about his new bear and he informed me that it was Mee-Mee’s mom! I asked if that meant she was Mee-Mee’s dad’s wife. Isaiah thought about it for a minute and then said, “Yeah, he is!” So Mee-Mee has his mom!